This is a dainty 1.4 oz, 1.25” by 0.6” by 0.4” cluster of angel’s peace quartz and she is amazing through and through. She is a very sweet Spirit with a bit of golden healer staining … and she is clear with a gorgeous suffuse pastel turquoise-green coloring. She has two flat sides, accented with little crystal caves and the cluster on top. She comes from Pakistan from an area known for its copper deposits and it has been thought that the inclusion is a combination of chlorite and fuschite, neither of which contain copper. So, you be the judge ... no matter what, she is a rare and beautiful Spirit!! I guarantee you’ve never seen anything like her! Although dainty and small, I was overwhelmed by the sense of peace and security I felt when holding this sweet Spirit! It was as if angels had enveloped me with their wings and I was safe, secure and totally loved beyond anything I had ever experienced. My heart was open wide, my throat was open wide and my Third Eye was pulsing as waves of the most amazing turquoise color filled my aura. After a few minutes of this, I felt as if I just glowed. 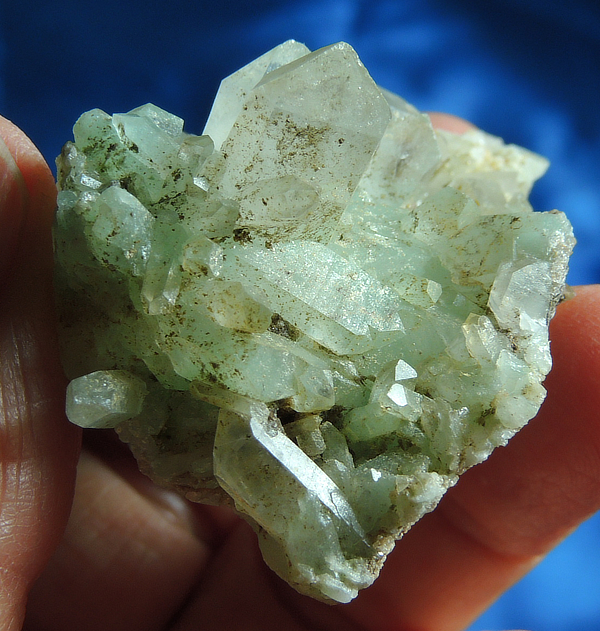 It’s interesting about some time ago, our beloved blue healer dog died suddenly of a heart attack a couple of years ago and the day before a shipment of these crystals arrived. I can’t tell you what a difference they made! As I unpacked the shipment and handled each of these precious gems, a bit more of the sorrow left me. There is still a profound sense of loss even years later, but I was able to see beyond it and focus on the total joy this dog, Nikki, had brought to me. I have since used it on Shen, Amber, Bear, Tasha, Misha, Little, Itty-Bit, Vic and Leo. And yes, we have had many animals … all foundlings as they seem to turn up where we are. Our household has always been filled with animals and we love each and every one and mourn their passing. There is a peace now that I don’t think would ever have been possible – truly an Angel’s Peace. These crystals are so incredible in helping you understand what is truly in your heart and instilling a comfort with that knowledge. Angels HAVE been here and they have guided our precious companions across the Rainbow Bridge. I share this experience with you because of the incredible sense of peace I get when I work with each and every one. They are indeed, an Angel’s gift. This Spirit feels right at home either over the Third Eye or the Heart, although I really favor the Heart – it is only with the heart that we truly see (from Antoine St. Exupery’s ‘The Little Prince’). She permits us a whole new level of compassion, understanding and love that we have never known.